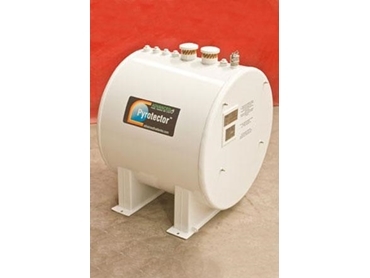 Pyrotector fuel tanks, now available from Advanced Fuel Tanks , are two-hour fire resistant tanks that feature a double skin steel lining, providing 100% secondary containment. other areas where clearance distances are not critical. To meet the demands of a two-hour fire resistant environment, Pyrotector fuel tanks have been designed to comply with various international regulations to ensure their suitability for the storage of flammable and combustible liquids. As they feature a secondary containment tank to provide maximum protection, these tanks require no additional bunding. The secondary tanks are both pressure and vacuum testable on site. A UL rated emergency vent is also incorporated on these tanks for maximum safety, which controls the pressure in the tank in extreme fire conditions to eliminate the possibility of an explosion. Standard free to air venting controls pressures changes experienced in normal conditions.